‘It’s kind of addicting’: People compete each night for the chance to charge the e-scooters in Salt Lake City. Meet one of them. (Trent Nelson | The Salt Lake Tribune) Jenn Hein activates scooters in Salt Lake City early Wednesday Aug. 8, 2018. Hein works as a Bird charger on the side to make some extra cash, picking up and charging electric scooters overnight and returning them to the city streets in the early morning. (Trent Nelson | The Salt Lake Tribune) Jenn Hein sets out scooters in Salt Lake City early Wednesday Aug. 8, 2018. Hein works as a Bird charger on the side to make some extra cash, picking up and charging electric scooters overnight and returning them to the city streets in the early morning. (Trent Nelson | The Salt Lake Tribune) Jenn Hein charges scooters in Salt Lake City Tuesday Aug. 7, 2018. Jenn Hein works as a Bird charger on the side to make some extra cash, picking up and charging electric scooters overnight and returning them to the city streets in the early morning. (Trent Nelson | The Salt Lake Tribune) Chase Hein captures a scooter in Salt Lake City Tuesday Aug. 7, 2018. His mother, Jenn Hein, works as a Bird charger on the side to make some extra cash, picking up and charging electric scooters overnight and returning them to the city streets in the early morning. (Trent Nelson | The Salt Lake Tribune) Jenn, Ady, and Chase Hein find three scooters locked in a parked vehicle in Salt Lake City Tuesday Aug. 7, 2018. Hein works as a Bird charger on the side to make some extra cash, picking up and charging electric scooters overnight and returning them to the city streets in the early morning. (Trent Nelson | The Salt Lake Tribune) Ady, Chase, and Jenn Hein charge scooters in Salt Lake City Tuesday Aug. 7, 2018. 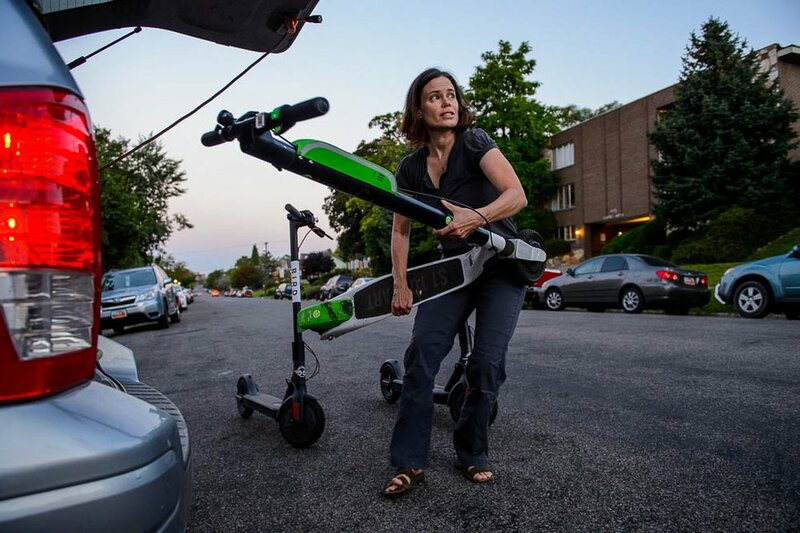 Jenn Hein works as a Bird charger on the side to make some extra cash, picking up and charging electric scooters overnight and returning them to the city streets in the early morning. (Trent Nelson | The Salt Lake Tribune) Jenn Hein unloads scooters in Salt Lake City early Wednesday Aug. 8, 2018. Hein works as a Bird charger on the side to make some extra cash, picking up and charging electric scooters overnight and returning them to the city streets in the early morning. (Trent Nelson | The Salt Lake Tribune) Chase and Ady Hein capture scooters in Salt Lake City Tuesday Aug. 7, 2018. Their mother, Jenn Hein, works as a Bird charger on the side to make some extra cash, picking up and charging electric scooters overnight and returning them to the city streets in the early morning. (Trent Nelson | The Salt Lake Tribune) Jenn Hein sets out scooters in Salt Lake City early Wednesday Aug. 8, 2018. Hein works as a Bird charger on the side to make some extra cash, picking up and charging electric scooters overnight and returning them to the city streets in the early morning. Her children, Ady and Chase Hein, help out. (Trent Nelson | The Salt Lake Tribune) Jenn Hein sets out scooters in Salt Lake City early Wednesday Aug. 8, 2018. Hein works as a Bird charger on the side to make some extra cash, picking up and charging electric scooters overnight and returning them to the city streets in the early morning. Her daughter Ady helps out. (Trent Nelson | The Salt Lake Tribune) Jenn Hein sets out scooters in Salt Lake City early Wednesday Aug. 8, 2018. Hein works as a Bird charger on the side to make some extra cash, picking up and charging electric scooters overnight and returning them to the city streets in the early morning. (Trent Nelson | The Salt Lake Tribune) Jenn Hein checks the status of scooters left to charge overnight as she prepares to return them to downtown Salt Lake City locations early Wednesday Aug. 8, 2018. At left is her daughter Ady Hein. (Trent Nelson | The Salt Lake Tribune) Chase and Ady Hein capture a scooter in Salt Lake City Tuesday Aug. 7, 2018. Their mother, Jenn Hein, works as a Bird charger on the side to make some extra cash, picking up and charging electric scooters overnight and returning them to the city streets in the early morning. (Trent Nelson | The Salt Lake Tribune) Jenn Hein loads scooters in Salt Lake City Tuesday Aug. 7, 2018. Hein works as a Bird charger on the side to make some extra cash, picking up and charging electric scooters overnight and returning them to the city streets in the early morning. (Trent Nelson | The Salt Lake Tribune) Jenn Hein loads scooters in Salt Lake City early Wednesday Aug. 8, 2018. Hein works as a Bird charger on the side to make some extra cash, picking up and charging electric scooters overnight and returning them to the city streets in the early morning. “I think we’re on a goose chase here,” Jenn Hein says with a smile as she looks down at her phone, which was supposed to lead her to three electric scooters that are just not there. It’s the last stop of the night, and darkness blankets an apartment complex in Salt Lake City’s Rose Park neighborhood as Hein’s 14-year-old twins clamber out of her silver SUV and run off to search, their voices and laughter filling the quiet. Hein rushes over to a parked car. Peering inside, she sees three scooters stretched from the back seat to the front across the center console. 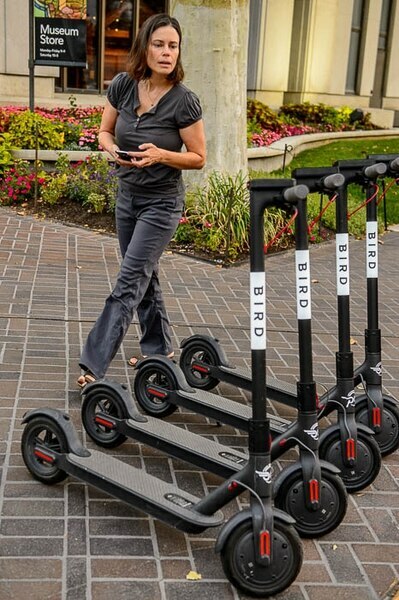 “This is obvious,” Hein says incredulously and starts filling out a report to let the scooter company, Bird, know someone is likely hoarding these in hopes of earning a higher payout. 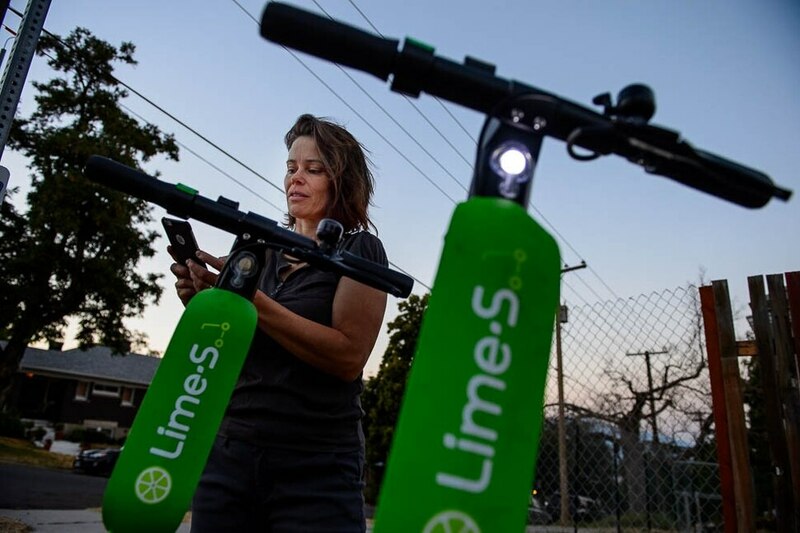 Hein is a scooter charger — what Bird calls a “bird catcher” and its competitor Lime calls a "juicer.” She is one of dozens of people around Salt Lake City who work to ensure that hundreds of scooters that have been dropped on city streets since the end of June don’t lose power. 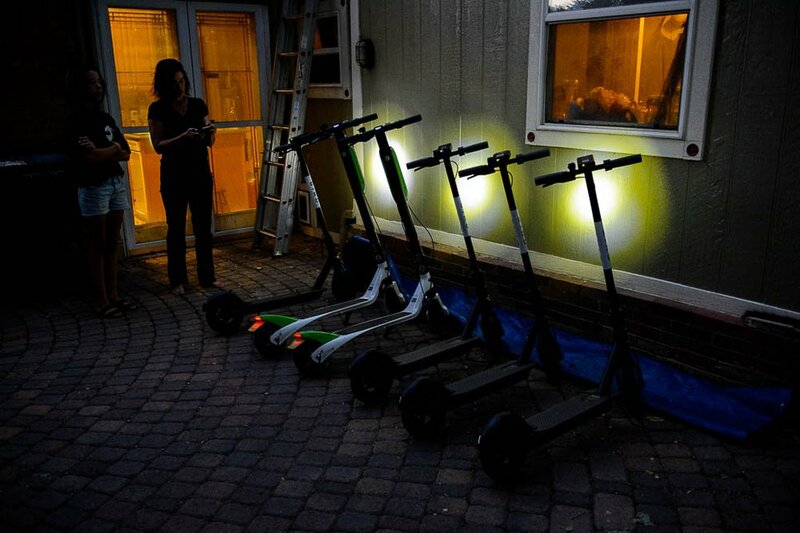 After the scooters are “released” each night, she joins a digital scavenger hunt to see who can get to each one first, scan its QR code and then capture it to take home, charge it overnight, and return it to the streets in “nests” before 7 a.m. the next day. The process has some bugs, and Hein’s experience in Rose Park this recent Tuesday evening demonstrates perhaps its biggest one. Birds are labeled as green, yellow or red on the app, and each color corresponds to how difficult the scooter is to find and to what its payout could be. Greens are usually the easiest to locate and are worth $5, while reds can be up to $20. Realizing they can often earn the highest payout by doing the least work, chargers in some markets hoard scooters and wait until they become red on the app so they can put them back on the streets. Empty-handed for this last leg of the journey, Hein and her kids get back in the car, where three Birds and two Limes are already stacked in the trunk. But over the sound of the screeching scooters and her children laughing and joking in the back seat, Hein says the quirks in the system don’t bother her — they’re simply part of the charging experience. (Trent Nelson | The Salt Lake Tribune) Jenn Hein checks the status of scooters left to charge overnight as she prepares to return them to downtown Salt Lake City locations early Wednesday, Aug. 8, 2018. At left is her daughter Ady Hein. 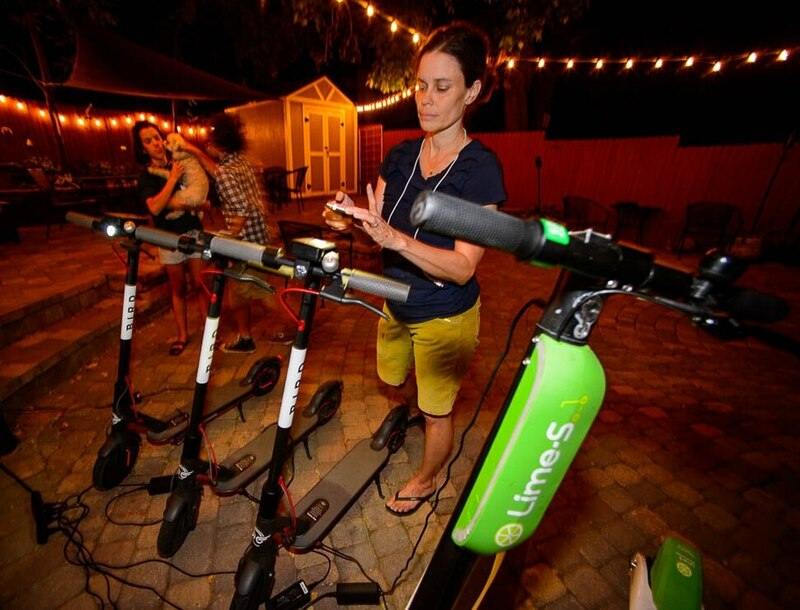 Bird launched its scooters in Salt Lake City at the end of June, and Lime was quick to follow after Utah’s capital created temporary rules for such companies. The companies market their charger positions as an easy way to make $20 to $30 per hour. Hein, who usually gathers scooters six nights a week, said she makes anywhere from $30 to $45 a night but has made as much as $80. She has six chargers that Bird provided after she signed up. They can be used for either brand, and she said she tries to capture at least six scooters each night. Lime has about 50 “juicers” in the Salt Lake City market, Gabriel Scheer, the company’s director of strategic development, told a group of state lawmakers in a meeting about the new technology last week. And the company said it’s heard positive things from members of its slice of the gig economy. Hein says she likes the competitive element of the job. Bird did not respond to requests for comment about its scooter-charger jobs. Are they ‘helpful in that way’? In Hein’s eyes, there are pros and cons to capturing Birds versus Limes. Though the payout is the same, she says she prefers Birds because they’re lighter and easier to load into her trunk by herself. But the Limes are easier to find, she says, because they’re brightly colored, and they’re also easier to electronically capture, which is nice when she’s alone. (Trent Nelson | The Salt Lake Tribune) Jenn Hein unloads scooters in Salt Lake City early Wednesday, Aug. 8, 2018. Hein works as a "Bird charger" on the side to make some extra cash, picking up and charging electric scooters overnight and returning them to the city streets in the early morning. At first, Hein would charge the scooters inside her house. But now that she’s a bit more experienced, she’s found it’s easier to plug them in on her backyard patio. She says she hasn’t seen an increase in her energy costs since she started charging the scooters; Scheer told the legislative committee that they cost about 30 cents each to charge in Utah. Bird and Lime have marketed themselves as an alternative to cars, bridging a person’s last mile of transportation in a way that has a low carbon footprint. But some community members have expressed concern that the charging element of Bird’s operation may actually generate more car trips than it saves. That’s because chargers, like Hein, drive around as they look for scooters to pick up, plug in and place back on the streets. But McMahon, a representative for Lime, said that while the system isn’t exactly emissions-free, it’s still better than the alternative. The next morning, Hein is up and loading the scooters back in her car before the sun has completely risen. She drops the Lime scooters outside a hair salon in the Avenues near her home and places the Birds outside the Church History Museum in downtown Salt Lake City before continuing on with her day. She says dropping the scooters off in the morning is “the least fun part” of the experience, since there’s no competitive element. But she knows that, come nightfall, she’ll be out again, cellphone in hand, hunting for scooters in need of a charge.